“I’d always wanted to go into property as a career, and when I saw that IMS were advertising for apprentices, I decided to apply. As well as performing well at work, you have to write essay-type answers detailing your knowledge of various areas of the workplace for the course. “It’s quite demanding, with quite a lot of work at home, but the college was really good and supportive if I was having any problems, or stuck on anything. I’d really recommend my course to anybody wanting to get into this line of work because it gives you a real background into the world of customer service. 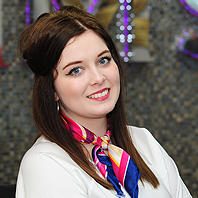 Find out about studying Customer Service at Derby College.